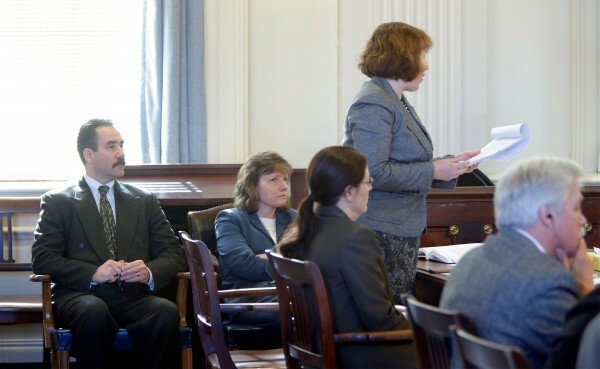 Natalie Burns (standing), an attorney representing the town of Kennebunk, addresses Justice Nancy Mills during a hearing in York County Superior Court in Alfred on Friday, Feb. 22, 2013. Seated (from left) is Kennebunk Police Chief Robert McKenzie, York County District Attorney Kathryn Slattery, Deputy District Attorney Justina McGettigan and defendant Mark Strong Sr.
Robert MacKenzie, Kennebunk police chief, answers a question asked by defense attorney Daniel Lilley during a hearing at York County Superior Court in Alfred on Friday, Feb. 22, 2013. MacKenzie revealed that there is a written record of a reprimand against Officer Audra Presby, the lead investigator in the Kennebunk prostitution case. That document has not been shared with the defense lawyers for Mark Strong Sr.
ALFRED, Maine — Defense attorneys in the first of two major trials in the high-profile Kennebunk prostitution case set their sights on the credibility of the lead police investigator in the case Friday, bringing up alleged past misconduct, decrying the deletion of her personnel records, and calling into question evidence she handled. On trial is Mark Strong Sr., a Thomaston insurance broker and part-time private investigator who is accused of conspiring with fitness instructor Alexis Wright to run a prostitution business out of her Kennebunk Zumba studio. Wright faces a separate trial scheduled to begin in May. Looming over the case now is a renewed defense motion to throw out all 13 remaining promotion of prostitution-related charges against Strong in light of what his attorneys have called regular problems with evidence in the case. Throughout the case, Strong and his legal team have alleged that he was the target of police payback for research he was doing into members of the Kennebunk Police Department, most significantly Officer Audra Presby, who led the investigation into the alleged prostitution business. Less than two hours before Presby was scheduled to take the witness stand Thursday afternoon, the court received a letter from a lawyer with the Kennebunk firm Jensen Baird Gardner & Henry, representing the police department, announcing that past police personnel files are periodically purged in accordance with the union contract and that no disciplinary records exist for Presby. That news frustrated defense attorney Daniel Lilley, who has openly said he planned to reference in cross-examination a reprimand Presby reportedly received in 2009 for an affair she had at the time with her married then-supervisor, Nicholas Higgins. Lilley has suggested Presby pulled Strong into the investigation as retaliation for research he was doing into that affair and subsequent custody battles over Higgins’ child. Attorney Natalie Burns, from Jensen Baird representing the police, reiterated in court Friday morning that no written disciplinary files remain in Presby’s record. Lilley requested and received additional clearance Friday morning to question Presby, Higgins and their supervisor, Police Chief Robert MacKenzie, about the affair and surrounding controversy. But he argued that the potential lack of personnel files — as well as Burns’ contention that MacKenzie cannot be questioned about internal investigations, except for resulting written disciplinary actions — put the defense at an unfair disadvantage. “Let’s assume Officer Presby committed a crime and the chief knew about it, all he has to say is, ‘There was no disciplinary action’ and that would be the end of it,” a frustrated Lilley told the court Friday. “That’s the easy way out to hide the file if one were to be cynical about it. In subsequent questioning of MacKenzie on Friday morning, the chief admitted the written disciplinary action that came from the investigation into the relationship between Presby and Higgins is still kept in a file cabinet, even though it has been purged from Presby’s official personnel file. Lilley requested that document Friday, and Burns said she would produce it for the court. Presby and Higgins will likely be called to testify next week. In that setting, Lilley is expected to probe into their relationship, as well as subsequent allegations that Presby had inappropriate sexual contact with Higgins’ 5-year-old child at the time. MacKenzie on Friday told the court the allegations of inappropriate contact were ruled “unfounded” by the state Department of Health and Human Services. Kennebunk police Lt. Anthony Bean Burpee stated in a fall news release that Presby was disciplined for the affair long ago, and that it has no relevance to the department’s pursuit of Strong. Higgins is no longer with the department. In a pretrial decision, Superior Court Justice Nancy Mills had ruled that Lilley could pursue the payback argument, rejecting a motion by prosecutors to bar discussion at the trial of alleged retribution by law enforcement. Mills said Lilley first began seeking background records for police investigating his client in July 2012, and said she shared the defense attorney’s frustration that “on Feb. 22, 2012, in the middle of the trial,” problems continue to emerge with those records. The judge has not ruled on Lilley’s latest motion to dismiss charges, filed in part because of those continued problems. “At some point, the apologies aren’t going to be enough,” Lilley told the court Friday morning. Among the witnesses called by the prosecution to testify Friday were Maine State Police Detectives Lauren Edstrom and Herbert Leighton, as well as state Sgt. Mark Holmquist. The state police investigators described their respective roles in the July 10, 2012, execution of search warrants at Strong’s Thomaston home and insurance agency. During cross-examination, Holmquist acknowledged that although the search team agreed that all electronic evidence — such as computers, hard drives and laptops — seized from Strong’s properties would be placed in the evidence locker at the state police’s barracks in Gray, one hard drive was taken along with nonelectronic evidence back to Kennebunk by Presby. Holmquist said Presby took the black Toshiba hard drive in question to the state computer crime lab in Vassalboro on July 12, the same day the state police brought the other electronic evidence to the specialists, and that Holmquist himself picked up all of that evidence — including the disputed hard drive — for transfer back to Gray on July 18. But he also acknowledged that no serial number was logged for the one Toshiba hard drive handled by Presby on the form listing the evidence being picked up on July 18. 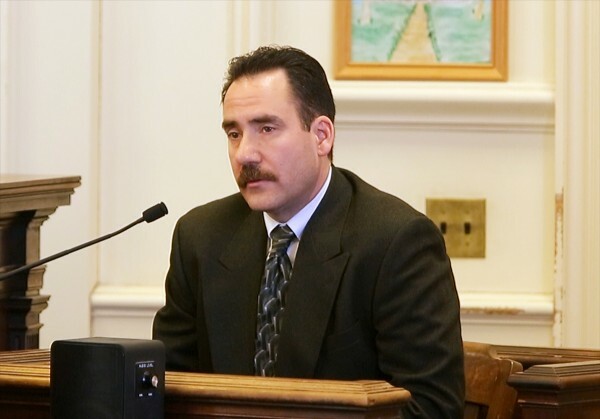 The defense attorney also called for Holmquist to recall concerns expressed at the time of the search warrant execution by Strong’s brother, an attorney, and relayed to him by detectives on the scene. Holmquist said he was told at the time that Strong was investigating the Kennebunk Police Department, and that potentially damaging information about members of that department was saved on Strong’s computer equipment. “[Strong’s brother] expressed his concerns that the computer evidence stay with the state police and not go with Officer Presby or any other members of the Kennebunk Police Department,” Holmquist told the court. Lilley asked Holmquist to tell the court why thorough records logging the chain of custody of evidence are important in a criminal investigation. “If there are gaps in the continuity of evidence, there are possibilities of tampering or mishandling,” the state police sergeant answered. However, York County Deputy District Attorney Justina McGettigan asked Leighton, who led the search team at Strong’s insurance agency, to read his original paperwork from the scene, including the serial number of the disputed Toshiba hard drive logged at the site. That number matched the serial number of the device currently in the hands of the prosecution. McGettigan suggested that the matching serial numbers validates the hard drive’s chain of custody. Witnesses called Thursday included a Kennebunk pizza parlor manager whose business was next to Wright’s fitness studio, and said Wright dropped her towel and approached him naked when he made a home delivery of spaghetti and meatballs one night. The Strong trial has been marked by regular and lengthy delays in the proceedings. On Jan. 24, the third day of jury selection, the Portland Press Herald and its parent group, MaineToday Media, put the case on hold by appealing to the Maine Supreme Judicial Court the decision by Mills to block public and media access to that process. The high court ruled in the newspaper’s favor, but before jury selection could continue the next day, the case was appealed again to the state supreme court by prosecutors, who challenged Mills’ ruling in favor of a defense motion to dismiss 46 privacy invasion charges against Strong. The high court upheld the charge dismissal in a ruling more than three weeks later.